Archive for the ‘Halloween’ Category. 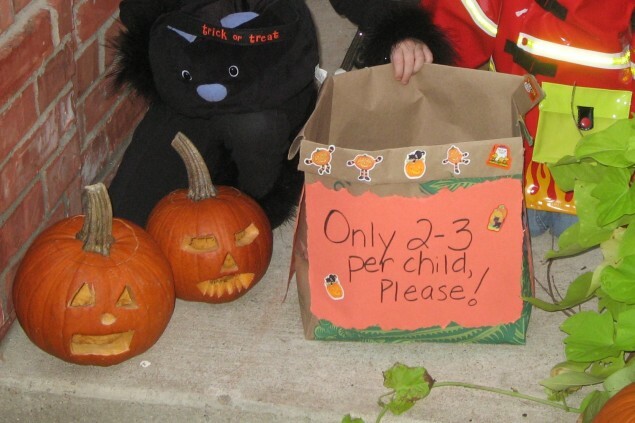 Want 2 meaningful Halloween tradition ideas for your family? 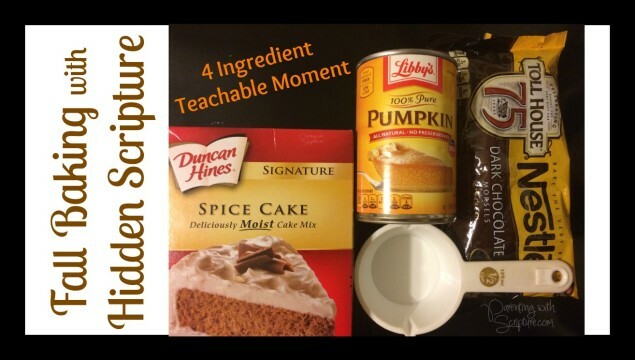 Your family’s pumpkin carving can turn into a meaningful and memorable lesson! 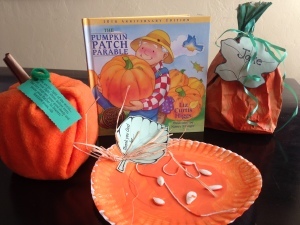 We are fans of Liz Curtis Higg’s book, The Pumpkin Patch Parable. This is written for preschool through early elementary and has great Biblical analogies for the whole pumpkin growing and carving processes! These principles have stuck with us beyond those ages as we continue to discuss them during our annual carvings. Toilet Paper Pumpkin – Cut orange felt and wrap a roll of toilet paper, stuffing the edges in the top. Roll a piece of brown paper and stuff in for the stem. Wrap a green pipe cleaner around a pencil to make a curly-q. Attach the following verse. 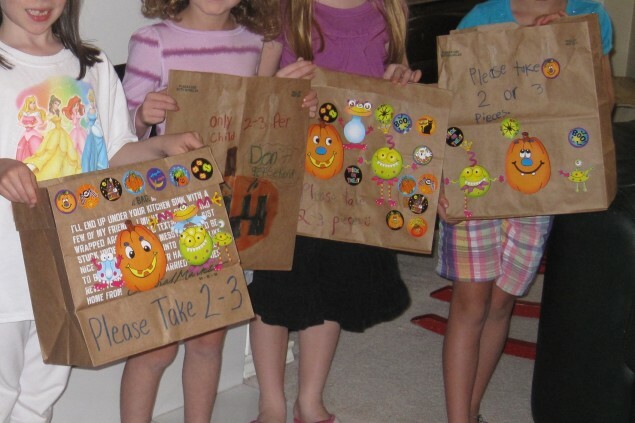 Paper Bag Pumpkin – Stuff a brown paper bag with crumpled newspaper, paint 3/4 orange and 1/4 green or leave it brown. Tie green curly ribbon to create the tendrils and attach a green paper leaf with the child’s name on it. My family makes the most of this opportunity by having tracts mixed in with the candy bag. American Tract Society www.atstracts.org has a number of fun Halloween themed, child-friendly tracts available for ordering. Because we are out trick-or-treating with our own children on Halloween night, we are not at home to pass out the treats. 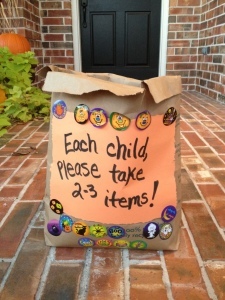 So, every year we decorate a brown grocery bag, fill it with candy and tracts, and leave it on the porch along with a note instructing the trick or treaters to only take 2-3 things. Who knows whether or not they all abide by “take 2-3 things” note, but we figure whoever gets the tracts are the ones meant to have them. My kids love prepping the bag and then together we pray over the bag that God would use the tracts to help the recipients learn more about Him and salvation through Jesus. Have another idea for bringing God’s Word into Halloween? Please share! 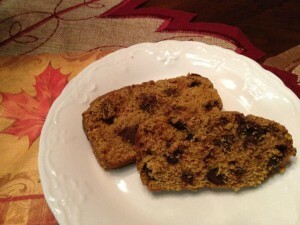 Holiday Traditions: Treating Trick-or-Treaters with the Good News! “What other time do friends, neighbors, and strangers knock on your door and ask for a treat? !” I wish I could remember who I heard say that years ago because I would thank him or her for the impression it made on me. My family makes the most of this opportunity by having tracts available to give out with the candy. American Tract Society www.atstracts.org has a number of child-friendly tracts available for ordering. I’m about to order ours so we’ll have them in plenty of time before Halloween. Because we are out trick-or-treating with our own children on Halloween night, we are not at home to pass out the treats. So, every year we decorate a brown grocery bag, fill it with candy and tracts, and leave it on the porch along with a note instructing the trick or treaters to only take 2-3 things. Who knows whether or not they all abide by that rule, but we figure whoever gets the tracts are the ones meant to have them. My kids love prepping the bag and then together we pray over the bag that God would use the tracts to help the recipients learn more about Him and salvation through Christ Jesus.